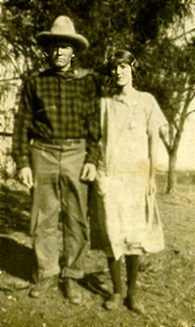 Delmer and Anna Mae (Vanderheiden) Thomas. This picture was taken about 1925. Anna Mae (Vanderheiden) Thomas (standing at left) with her parents, Jacob and Mollie Vanderheiden, seated in front, and her brother Macon, sister Bonnie, brother Blackie, and brother Virgil.